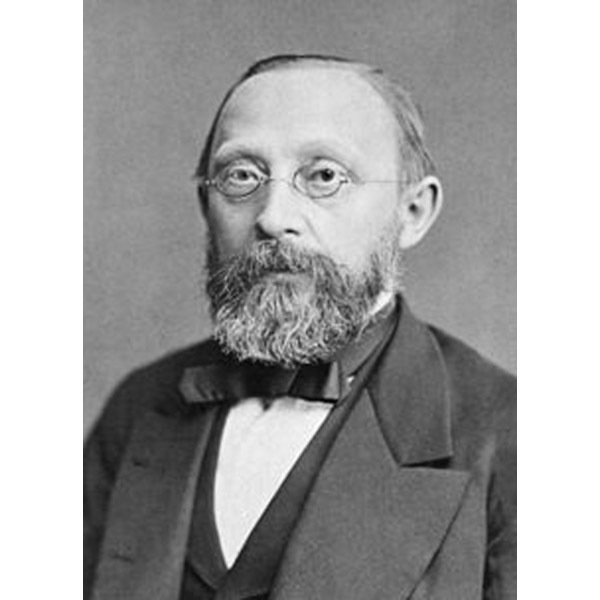 Virchow’s law: Virchow’s law states that skull growth is perpendicular to suture lines. Growth of the brain and the skull’s expansion at the suture lines give the characteristic infant head shape that is narrower in the frontotemporal regions and wider in the biparietal regions. This early recognition of aberrant skull growth led to the first attempts at surgical correction in the late 1800s (51). In-utero fusion of the suture: Primary synostosis occurs before birth, prevents bone growth perpendicular to the suture, and allows for compensatory growth at other sutures. The current theory for this embryonic closure suggests an interaction between underlying dura and abnormal osteoblast populations at the osteogenic front of the suture. The osteoblasts have an increased response to growth factors. Primary craniosynostosis usually occurs sporadically or as part of a syndrome. Fusion of the suture at later date: Secondary synostosis is related to rickets, vitamin D-resistant rickets, hypophosphatemia, hyperthyroidism, polycythemia vera, thalassemia, sickle cell anemia, medications (methotrexate, valproic acid), Hurler’s and Morquio’s syndromes, and overly shunted hydrocephalus. There is also a slightly increased risk for its occurrence in children born to mothers who took chlorpheniramine, chlordiazepoxide, or nitrofurantoin during pregnancy. Resorbable fixation techniques: Cranial fixation has evolved from wire and steel plates to absorbable suture and absorbable plating systems. Metal fixation devices have been seen to migrate to the inner table of the cranium and been identified embedded in dura during radiographic evaluation or secondary surgeries. Metal plates have been thought to inhibit normal bone growth. Absorbable suture and plates are commonly used for initial stability, allowing the native bone to grow and fuse. These materials degrade in 6–12 months, leaving no artificial material in the surgical bed. The complications from newer absorbable material are minuscule and include sterile seroma during absorption and breakage, <0.5% on average (58, 59, 62). Distraction osteogenesis: Novel areas of investigations include distraction and spring devices. Distraction osteogenesis for unilateral coronal craniosynostosis can advance the orbit 17 mm with a minimal complication rate (56). Spring and distraction devices have been investigated for use in sagittal craniosynostosis (60, 62, 63). The downsides to the use of these devices are the need for a second surgery to remove them and, as noted above, imbedding of the metal into the bone and/or dura. Imaging: Three-dimensional head CT reconstruction is not necessary for the preoperative evaluation of single suture craniosynostosis. A current report describes the use of high resolution CT scanning to assist in surgical planning and reconstruction in the hope of decreasing operating time (57). At this point, this author does not see the benefit of this technique outweighing the radiation dose to the patient. Bone substitutes: Bone substitutes are not commonly used in a single suture craniosynostosis repair. The author’s service prefers particulate calvarial bone graft (61). A review article on possible substances has been published by Goodrich et al. (62). Suture release – Lannelongue in 1890: Lannelongue undertook the first strip sutural releases in 1890. He did not resect the suture. Others followed in his footsteps over the next few years (52). Four years later Jacobi, a prominent pediatrician at the time, marked the end to surgical correction of craniosynostosis when he announced that 15 of 30 patients operated on for craniosynostosis had died. It took more than 2.5 decades to revive the procedure (52). Craniectomy of suture – Mehner in 1921: A paper published in 1921 introduced the concept of suture resection as opposed to a simple “release” (52). Review of use of materials to slow refusion – Faber and Towne, 1940: The neurological and cosmetic improvements from strip craniectomies and suturectomies increasingly were appreciated. However, the refusion rate with strip craniectomies was significantly high. Numerous products, including polyethylene film, silastic strips, and tantalum foil, were placed at the suture sites to prevent refusion. These products failed to prevent the resynostosis (52). Cranial vault remodeling – Tessier, 1950s and 1960s: Tessier from Paris is considered the father of craniofacial surgery, and he pioneered the techniques that emphasized the cosmesis. He and other developed the open invasive cranial vault expansion and remodeling that was the mainstay of treatment from 1960 to 1990. There were significant improvements in anesthesia and blood transfusions in the early 1950s and 1960s (52). Advanced vault remodeling – Epstein, Jane, McComb and others, 1960-1980s: Bifrontal craniotomies with orbital rim advancements, total cranial vault reconstructions, Pi procedures, and posterior cranial vault remodeling were the mainstays of craniosynostosis repair. These larger procedures required longer operative times and hospital stays. Complication rates and blood loss vary among institutions (52). Endoscopic – Jimenez and Barone, 1990: Simple suturectomy via endoscope with barrel staving and postoperative head helmets was developed. Operative times and hospital stays are short. In general, blood loss is less than that which occurs in the open procedure. Cosmetic results are comparable, and reoperation rates are similar to those of the the open procedure (24, 25).